Buy The Raw Chocolate co Raw Cacao Butter 240g in the UK from our online shop or directly from our independent Scottish store. Cacao Butter is the edible fat extracted from the raw cacao bean. It is a delicious ingredient in raw chocolate & dessert making, as well as great on porridge. Fairtrade and Organic. 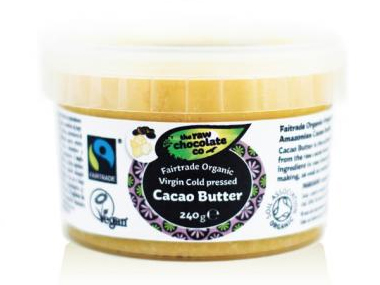 This Virgin Organic Cacao Butter is the pure oil extracted from the whole raw cacao bean. The oil is made using a cold pressing technique where the temperature never exceeds 60°C, ensuring the high quality and nutritional integrity of this product. Our Cacao Butter has a lovely ‘chocolatey’ aroma, and is a delicious ingredient in raw chocolate, cake and dessert making. Try a teaspoon of it on top of your porridge in the morning to raise your meal up to a sumptuous, silky treat. We sell real Raw Chocolate co and other Baking Sundries directly from our shop in Scotland and online throughout the UK. View more products from Raw Chocolate co.
Where can you buy real Raw Cacao Butter 240g safely online? If you are wondering where you can buy The Raw Chocolate co Raw Cacao Butter 240g safely online in the UK, then shop with us. We are an actual health foods shop; with real people selling real foods and products. Our award-winning independent shop is located in Stirling, Scotland since 1976. You can buy our Baking Sundries in store or safely place an order with us online or over the phone. Raw Cacao Butter 240g - The Raw Chocolate co Raw Cacao Butter 240g in Baking Sundries and Baking.